Having a healthy and balanced diet is a matter of acquiring habits rather than strictly following a series of foods. 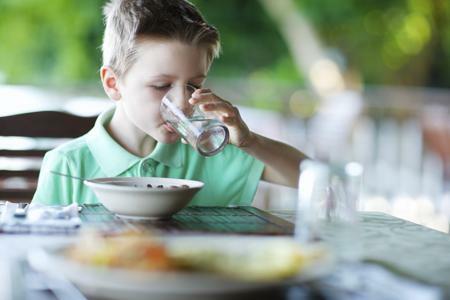 Drinking water at meals is one of those habits that we can change to balance the diet, as we will avoid excess sugary drinks and improve hydration. One of the biggest problems in today's diets is the excess of simple sugars. Sugary or alcoholic beverages are replacing water at mealtimes and are slowly weighing on the diet. Although the basis of all beverages is water, we can not equate nutritionally, for example, a glass of mineral water to a glass of soda. If instead of drinking 2 liters of water daily we substitute them for soft drinks, juices or alcoholic beverages we will be increasing in 500-1000 kcal the energy consumption, something that is not negligible. For this reason, among others, water is included within the food pyramid and is one of the first steps taken in slimming diets. Soda and water substitutes at meal times should be sporadic, we drink on special occasions or a glass a day, but the moment we drink more of these drinks than water, the balance of our diet will be unbalanced. Drinking water at meals can be a good first step if you want to start having a healthy and balanced diet, do not hesitate. Water intake is always considered a healthy habit alone, but also, a recent survey indicates that drinking more water helps to eat better, something that has not been investigated until now. After analyzing the consumption data of more than 18,000 adults and considering the educational level and income, body weight and race, it was verified that the water intake is positively associated with the quality of the diet. Specifically, it was observed that when water consumption increased, the intake of calories, total and saturated fats, cholesterol, sugars, and sodium were reduced, all of which translates into better nutritional quality. The results were even observed with an increase in water intake of 1% per day, which indicates that a substantial change in consumption is not necessary to begin to see results. However, the changes may be higher if we drink more water in replacement for soft drinks for example, or if the effect on calorie reduction is because we consume less fast food. First, we must say that as a general rule, those who drink more water are precisely those who eat more healthy. Therefore, the results of the study could be due to a greater consumption of water accompanied by dietary care and from there, the Improvement in the quality of what was eaten. Also, as has been concluded in a different review, the caloric deficit that favors weight loss is produced when drinking water in replacement of soft drinks or other sweetened drinks, something that could also happen in this research. That is, it is clear that drinking more water is a recommended behavior if we seek to take care of health by eating better. however, its greater intake alone can not achieve a healthy diet, as in addition, it should be accompanied by other behaviors such as eating more at home. And there, we will certainly drink more water and eat healthier. However, if you want to start slowly improving your diet, drinking more water may be the ideal kick to start a healthier diet.